The Moo.com website was just too cool to pass up. I immediately had the idea for capturing some of my "inworld" persona as part of my minicard image. I used a photoshop tutorial to learn how to make a comic book version of my face. Something went wrong and I so I started making it up as I went along. Making the sunglasses fully transparent was an accident but I loved the effect. 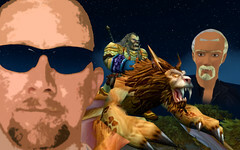 The scary looking guy driving the flying lion-thing is Crotalusatrx, my level 23 Orc Warrior from World of Warcraft. BTW - my new Core2duo iMac is amazing for playing Wow! The head on the far right is my avatar from Secondlife, RightBrain Musketeer. I'm still trying to find a look that I like, but for now that's what I look like in 2L. Can anyone tell me what a Crotalus Atrox is?